We are not developing a new A-level Pilot Use of Mathematics qualification due to government changes to A-levels. As an alternative, you may like to consider our new Level 3 Certificate in Mathematical Studies, or our new AS Maths and A-level in Maths, which have been developed for first teaching in September 2017. This qualification is a restricted pilot. Please contact the subject department if you would like more information about joining the pilot. 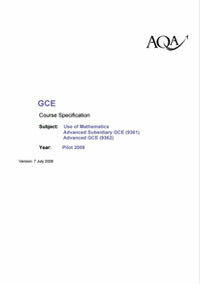 The AQA Pilot Use of Mathematics A-level was designed to widen participation in studying Maths beyond GCSE. Built upon AQA's pilot Free-Standing Maths Qualifications (FSMQs) at level 3, this qualification gives students valuable skills for their lives post-education, whilst supporting their studies in other subjects, for example Social Sciences, Geography, Psychology and Sciences. explore mathematical techniques through investigation and application.